1Rad-Reader Reviews: WRITE IT OFF! DEDUCT IT! WRITE IT OFF! DEDUCT IT! Are you paying more taxes than you have to? There are more than 19 million home-based businesses in the United States 56% of all businesses in the United States and they generate $102 billion in annual revenue. As far as the IRS is concerned, a home business is no different than any other business. But there is a difference: not only can you deduct the business expenses that every business is entitled to, you can turn personal, non-deductible expenses into tax-deductible business expenses if you are careful to follow the rules. No tax software or accountant knows the details of your home-based business like you do, and the IRS is certainly not going to tell you about a deduction you failed to take. 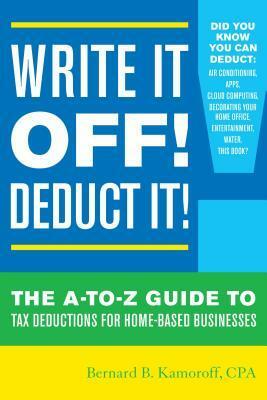 This invaluable book not only lists the individual items that are deductible in your home-based business from utilities to that part of the home where you work but also explains where to list them on your income tax form." I know that this review is late for this book is for tax season, but this was for me a very informative book. I do have a home business with my wife and together we are always trying to find the proper way of handling our receipts, mileage, and expenses. This book goes into all of that and tells you the best way to take the deduction on all of the items and if you do not have good records don’t take the deduction but start planning for the next year so you can take more deductions in the future. The author worked for the IRS and knows what they are looking for on the forms and if you put down a higher deduction without being able to verify the expense when or if you get audited you will be expected to pay back the amount plus you could pay an additional penalty. He also walks you through the steps for how much you can take off for your home if you should have a separate entrance and the different forms you need for the different deductions. This book has a lot of information and is a good book to have on hand and even by reading this now would be helpful for not all tax people know these business regulations. I should know we had one who did not but was good with other tax information and another lady who was good with all of the taxes. Overall a helpful book. I got this book from net galley. I give this 4 stars.